The nation was shaken when the citizens found out that there was a figure interfering with important affairs of South Korea.It was reported that President Park Gyun-Hye was getting advice from Choi Soon-Sil, who didn’t hold any government job. Choi is the daughter of a religious cult leader, who also happened to be a respected mentor of Park. According to CNN, the protest was conducted after Park ordered 10 of her senior secretaries to resign. 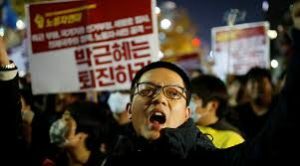 On Oct.29 there were over 12,000 people in the streets of Seoul, questioning who the real president was and demanding the president to step down from the office. President Park did apologize on a national broadcast station. She stated that she just wanted to seek advice on her speeches from Choi. Which many criticized her for the mismanagement of national information. Choi did admit that she received presidential documents in advance but she denied that she interfered with any of the state affairs. She was also accused of exploiting her relationships with Park, misappropriating funds from nonprofit organizations, which she also denied upon. The people are furious at Park, questioning her actions toward the nation and the citizens. The Korean community in Los Angeles is also enraged about the scandal. There is a very small population of Korean students attending Hollywood High, but its important to be aware with what’s happening in the mother land.